toppings and additions of your choice: here it was pretzels, matcha powder, tahini, strawberry jam, and vegan chocolate chip cookies. Double-boil a full 9 0z. bag of dark chocolate chips ( I use Enjoy Life) with a teaspoon of coconut oil added. In a bowl, mix 2 cups of peanut butter with powdered sugar and a tsp vanilla to desired sweetness (some people like super sweet cups and others don’t) and set aside. Put one tablespoon of the melted chocolate into the bottom of cupcake papers, then add a tablespoon of the PB filling (and whatever else you’re putting in there like a cookie or pretzels or jelly), then cover with another tablespoon (or two) of melted chocolate. Garnish with crumbles, pistachio, salt, or leave plain, and refrigerate until hardened. Try this recipe with any nut butter, and any toppings you can think of! Almond butter cup with dried blueberries? 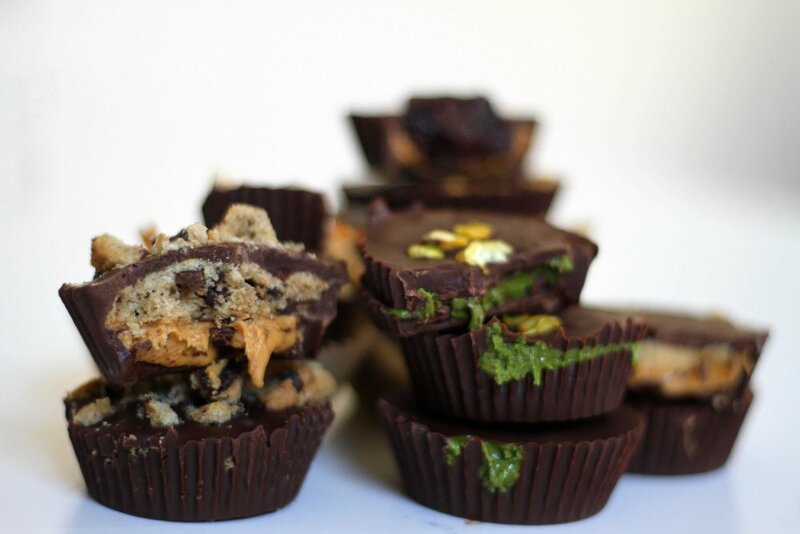 Cashew butter cup with cacao nibs? Sunflower butter cup with granola? Yes please. Double-boil means put a dry pot with the choc. chips inside a bigger pot with hot water. This prevents the chocolate from burning or drying out. You can powder your own sugar, coconut sugar, maple sugar, or any granulated sweetener but using a coffee-bean grinder or food processor. What flavor combo will you try?